At HammMade we design inviting touches for all your living spaces, both inside and out! Every work of art, restored item of furniture, hand-crafted frame, custom table, or builti-in specialty item is made with love and care. Natalie specializes in artwork and fabrics in the studio, while Tim constructs wood-based objects in the shop. They can also work together to add custom finishes with a reclaimed flair for your renovations and new builds. Many of the most popular items, such as one-of-a-kind paintings and unique cutting boards are available right in our online Shop. For bespoke design and special projects, please contact us directly to get the conversation started! 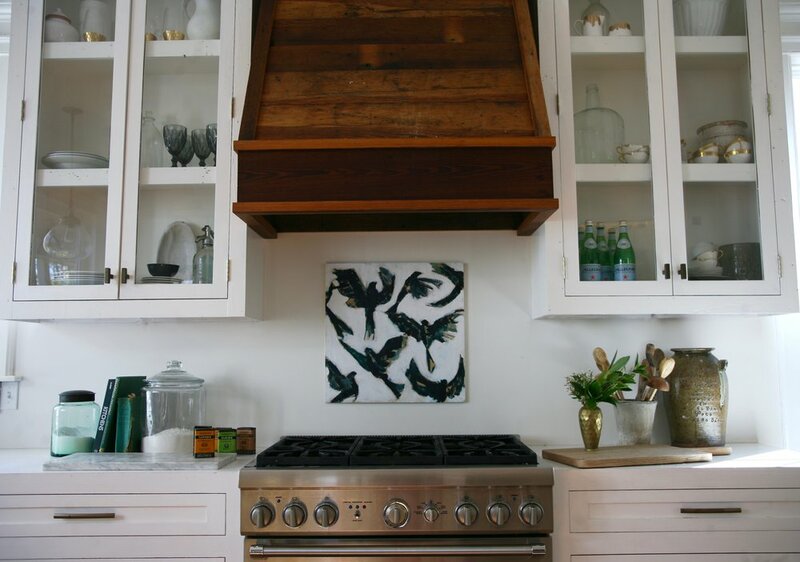 Custom wood designs like this vent hood can add warmth and charm to your interior. For portable natural accents, finely finished chopping and serving boards add an elegant touch to your kitchen and dining experience that your family and guests will love.